Model a satellite with a combination of 3D mechanics and block-based control logic. The satellite is launched from the Earth's surface with a launch sequence. Then a control logic subsystem adjusts altitude and velocity via thrusters. Mathematica is used to design the parameters of the control system. Visualize the path of the satellite with and without controller adjustments. 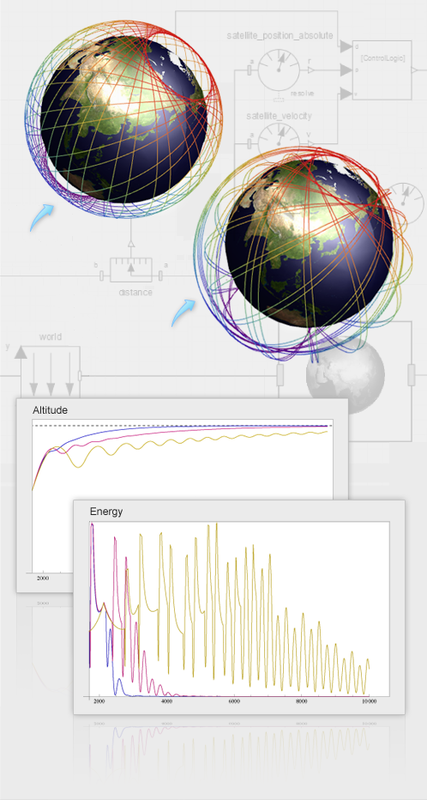 Design the parameters of the altitude controller of the satellite in Mathematica. Shown are the energy expenditure and altitude for three different altitude controllers. The dashed line is the target height. Easily show the altitude and energy expenditure for different control parameters.